(142.35E 3.14S) Aitape was a small village on the north coast of New Guinea, on the Australian half of the island. Prior to the war, it was notable only for the presence of a fairly decent anchorage, with no facilities to speak of. The coastal strip was five to twelve miles (8 to 19 km) deep and ended in the foothills of the Toricelli Mountains. In early 1942, the village was seized by the Japanese, who built fighter and bomber airstrips at Tadji, a few miles southeast near the coast. A third airstrip to the west was abandoned due to drainage problems. Advised by the code breakers that Hollandia and Aitape were only lightly garrisoned, MacArthur decided in March 1944 to invade both locations in order to bypass the large garrisons at Hansa Bay and Wewak. PERSECUTION, the assault on Aitape, was intended to secure the Tadji fighter strip to support the more important Hollandia landings. The invasion force was commanded by Brigadier General Jens A. Doe and was built around 163 Regiment of 41 Division. 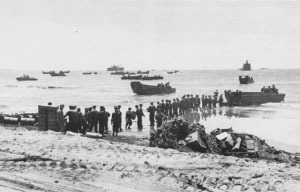 The troops landed on 22 April in nine waves on a two-battalion front, securing Tadji airstrip by nightfall. They were reinforced the next day by 127 Regiment, 32 Division. Opposition was light, since there were not more than 2000 Japanese in the area, of whom only about 250 were combat troops. One transport (Etamin) was badly damaged by a Japanese torpedo bomber. The airstrip was ready to receive Australian P-38s within 48 hours, and a bomber strip was ready on 15 June. Once Aitape was secured, 163 Regiment was pulled out for operations further west. It was replaced by 32 Division (Gill) on 4 May 1944. Gill established a perimeter and sent out patrols to watch the movements of Adachi's 18 Army, which had been cut off by the Hollandia/Aitape landings. Adachi was ordered on 2 May to move via inland jungle trails to western New Guinea, but demanded permission to attack Aitape instead. The Allies were warned well in advance of Adachi's intentions, likely by intercepting and decoding the messages between Adachi and his superiors, and they had plenty of time to bring in reinforcements, since Adachi was so lacking in transport that he was unable to assemble his forces sooner than early July. By the time the Japanese reached the Driniumor River (142.611E 3.265S), the Allied garrison had been reinforced by 43 Division, 124 Regiment, and 112 Cavalry Regiment, which with 32 Division were placed under XI Corps (Hall) on 28 June. The Americans now had fifteen infantry battalions and two cavalry squadrons deployed around Aitape. Nevertheless, on 10 July 1944, the desperate Japanese troops succeeded in punching a hole in the American line. The Americans counterattacked and regained their original positions by the 18th, but Adachi then tried to flank the American line in the south, deep in the jungle. This was followed by two weeks of confused seesaw fighting in the jungle between the coast and the Torricelli Mountains six miles to the south. Allied naval forces, ranging from PT boats to Australian cruisers, patrolled along the coast east of the Japanese lines and systematically destroyed the Japanese lines of communication, aided by spotter aircraft from Aitape that allowed the warships to hit targets as much as four miles inland. By 9 August the Japanese were forced to retreat. The Americans launched their own attack along the coast, driving the shattered remnants of 18 Army into the jungle, where they dwindled from starvation and disease until the Japanese surrender in August 1945. Japanese combat casualties numbered very roughly 10,000, while the Americans lost 400 killed and 2600 wounded.